More than 80 people competed in five sporting events: street ball, arm wrestling, weight lifting, table tennis, and darts. For the first time ever, a series of sporting events were held to coincide with the seventh Students Forum of BRICS countries in Moscow. The event, known as the ‘Universiade,’ is likely to become an annual event, bringing BRICS countries closer. 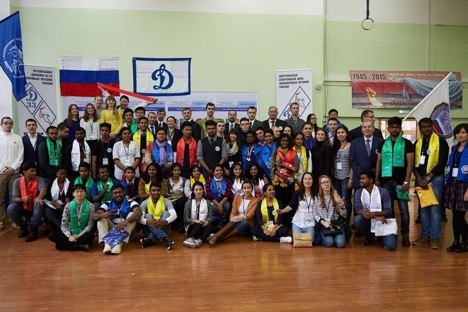 The seventh Students Forum of the BRICS (Brazil, Russia, India, China and South Africa) was held in Moscow during an international scientific and practices conference: “Threats and risks for the economies of BRICS countries”. For the first time in the history of this Forum, sporting events were also held, in which student teams from BRICS countries participated. The competitions were held at the National Nuclear Research University MEPhI, in conjunction with the Physical Education Department. This tournament, informally called the BRICS Universiade, was organized at the initiative of the Federal Financial Monitoring Service, the organization Dynamo No. 33, and the Central Sports Club of Russian financial authorities. The head of these two organizations, Oleg Shabunevich, said the sporting events were held on direct instructions from President Vladimir Putin. The opening ceremonies of the sporting events were also attended by well-known Soviet and Russian athletes. The students were welcomed by two-time Olympic USSR hockey team champion Vyacheslav Starshinov, four-time Olympic swimming champion Alexander Popov, and the outstanding Soviet biathlete Alexander Tikhonov, who won “gold” four times at the Olympic Games. More than 80 people competed in five sporting events: street ball, arm wrestling, weight lifting, table tennis, and darts. No one country came out as undisputed champions, winning every event, and so there were no hurt feelings. Russian athletes were best in the darts competition, the men’s team came second in the table tennis competition, two teams from MEPhI won first and second places in arm wrestling, and the women’s team from MEPhI finished third in the street ball competition. Representatives of China and India also earned top spots in various sports events. Vladimir Glotov, Deputy Director of the Federal Service for Financial Monitoring, said more work lies ahead for Russian athletes if they wish to improve their performance. He also drew attention to the healthy rivalry between Russian and Chinese athletes, something that has become a sort of a tradition, even at major international competitions.